Rerum Gestarum qui de xxxi Supersunt, Libri XVIII (Res Gestae). 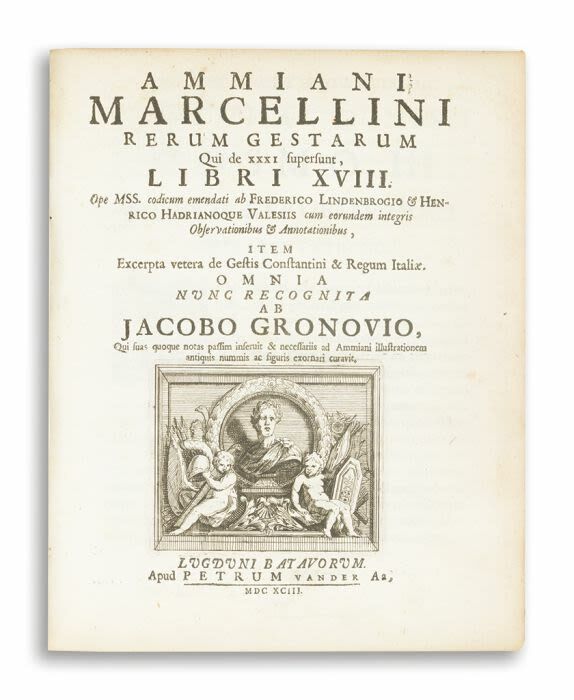 Edited by Jacobus Grovonius (Jacob Gronow). Additional engraved title. Text illustrations and engraved plates (including folding by Romeyn de Hooghe). Browned, light wear. Contemporary vellum, worn. Lg. 4to. Although originally 31 books, the first 13 volumes of this history have been lost. The surviving 18 books describe Roman military campaigns and political life from the years 353-378. "An admirable edition, highly spoken of by Ernesti and Harwood, and well known in the republic of literature. To the notes of Lindenbrogius and other editors (placed below the text) Gronovius has added some excellent annotations of his own" (Dibdin I:257).